The government is about to introduce huge changes to the UK tax system that will fundamentally affect the way you record and submit your tax information to HMRC. Essentially, the tax system will move from a yearly submission process to a quarterly digitally reported one. On the face of it, MTD may sound like a disaster waiting to happen. Most sole traders and freelancers struggle every year to get their bags of receipts and hastily typed up (or even written) list of invoices to their accountant – often a couple of weeks before the submission deadline! To any rational business person this is a crazy state of affairs. It’s not good for anyone involved and can lead to higher accounting fees (as the spend extra hours sifting through your piles of paperwork) and a nasty surprise tax bill at the end of the year because you didn’t realise you owed that much?! You almost definitely aren’t claiming all your legitimate expenses. Sole traders and freelancers don’t claim anywhere near enough of their legitimate expenses. In fact, three in five admit they can’t be bothered to mess around claiming low value receipts. This is a huge mistake – around 60% of expenses are under £20! And all those small claims will add up. Did you realise you can claim up to 20p in every £1 you earn back against your tax bill through claiming properly?! You’ll save yourself a lot of stress each winter! It’s the annual pantomime performed year after year. You start worrying in November, panicking in December and then all out meltdown in January as you scramble around looking for all those faded receipts. If you use a simple app like 1Tap Receipts, you’ll save yourself a huge amount of stress and know exactly where you are all year around. Plus, by being up to date and organised, you should get favourable rates from your accountant and avoid that unexpected tax bill! You can actually make informed decisions at last. 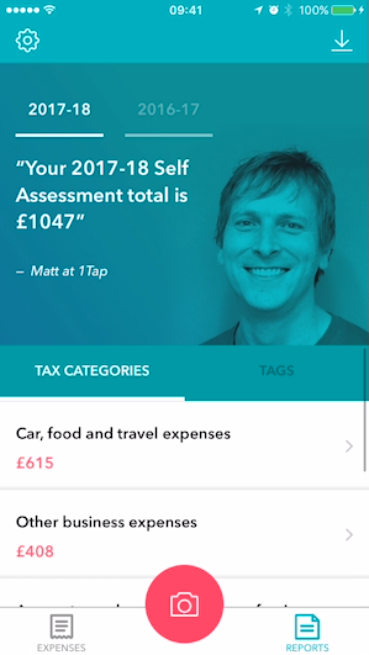 So now imagine that you are snapping all your receipts as you go and get a live view of how much you are saving on your tax bill. 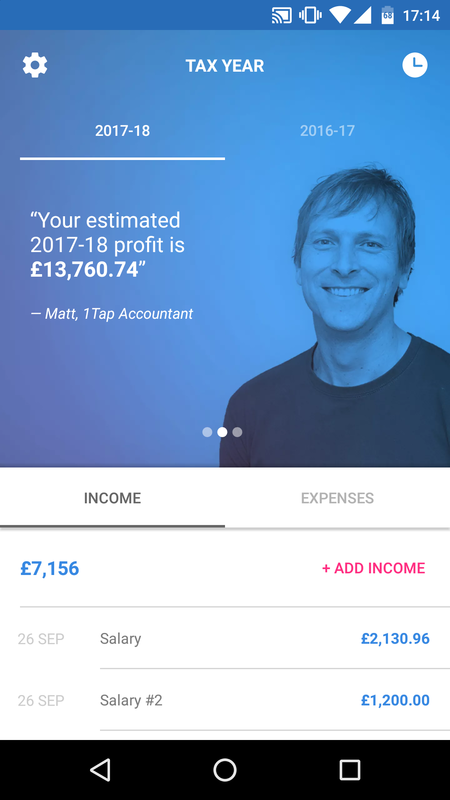 Not only that, but over the coming months, 1Tap will be launching an income stream recorder so you’ll suddenly see clearly where you are financially – which means that rather than guessing your financial health through rough guestimates, you’ll always have a live status you can use to make informed decisions. You’ll increase your creditworthiness immeasurably. Having that live and up to date view of your finances doesn’t just have a positive influence on your business finances, it also empowers you personally. Many sole traders and freelancers not only experience problems getting credit for business purchases, but also for mortgages and other personal loans. This is mainly because their income and personal finances are effectively one in the same. Lenders find it difficult to make favourable decisions based often outdated accounts. Once you move to a simple system like 1Tap Receipts and get on top of your finances you will be in a much stronger position to prove your financial health. Lenders will have much more information on which to make an informed lending decision!